On Tuesday at a meeting starting at 10am, the San Francisco County Transportation Authority will consider whether to spend an additional $4.5 million in engineering to assess additional options for the Downtown Extension (DTX) that will continue the Caltrain tracks to the Transbay Transit Center, serving Caltrain and High Speed Rail. Since the Downtown Extension was environmentally reviewed over a decade ago, tunneling technology has advanced, and the city has been exploring options to extend the tunnel further past the 4th and King station, eliminating the need for an awkward, bike-ped-hostile, and also expensive underpass at the 16th and 7th gateway to Mission Bay. San Francisco Planning has been conducting a multi-dimensional study considering a range of factors including adding buildings on land currently used by Caltrain to park trains; taking down and boulevardizing the stub end of I280 – an option that was panned by car-preferring neighbors; and alternative alignments for the tracks including moving a Caltrain station into Mission Bay (see image below for the alignment alternatives). Â An important next step in the study will be a community meeting this spring. The SFCTA discussion about taking the next step to assess DTX alternatives is being held in the context of an update on the DTX options study, and the currently shakyÂ status of federal funding for Caltrain electrification, which passed all the needed federal qualifications, only to be held up for lack of the Transportation Secretary’s signature as the Trump Administration contemplates eliminatingÂ all new transit capital funding. Eliminating or slashing federal fundingÂ would slowÂ Caltrain electrification, BART-Silicon Valley, the DTX project, and every other major transit project in the country. The SFCTA couldÂ consider the suddenly chilly climate for federal transit funding and decide to pause further investments in this major piece of the city and region’s transportation infrastructure. Or it could move forward, considering that the climate will likely shift again, and it’s better to have projectsÂ ready to goÂ when funding becomes available, whether it’s federal funding as expected, or other regional and state alternatives that could be needed to keep California moving forward while the countryÂ moves backwards. If you’ll be near San Francisco City Hall around 10am, consider stopping by to speak up for the Downtown Extension and continuing forward motion on the region’s transit infrastructure. I’m skeptical of the benefits of this project. Even if we had the money, it simply rearranges things without a clear improvement. For instance, it moves Caltrain 4th & King to Mission Bay. Sure, it’s closer to new Mission Bay developments, but it’s now further to all the offices in SOMA – and there are lots of those. 4th & King is also more central, so more places are within walking distance. That location also connects to N/KT, 30/45/47 buses. The Mission Bay location also has KT, but lacks N and other bus lines which then would have to rerouted. There would be some land that can be reclaimed, but much of it is already under 280, and if 280 gets pulled back, much of it goes to the boulevard, so not as much win there. One obvious benefit is the grade separation of 16th and Berry Streets are ‘nicer’, but is that worth having a less convenient station? This is probably a stupid question but how does one build tracks connecting to third street AFTER going under the freeway at Islais Creek??? In addition to the option of sticking with the current alignment, there are two alternative alignments proposed – one that would be adjacent to the current alignment but stay underground further, and a second that would go through Mission Bay. City planning director John Rahaim said yesterday that they would decide on a preference by the end of the year. I say replace the Caltrain Station at 4th&King with housing (I would like to see implementation of veteran supported housing, as part of this element), in addition i would endorse boulevarding the stub I280, and Not doing DTX, but rerouting Caltrain via Mission Bay or Pennsylvania Avenue Alignment. Because of the new Warriors new Chase Arena in it would be prudent to put a station somewhere to cover the fans getting into both Giants at AT&T and Warrior fans at the new Chase Arena, (“eventually, when Im dead, someone will thank me for it”), after Caltrain is electrified they will figure out how to build a new second BART tube under the Bay and simultaneously extend the BART/Caltrain to Alameda, Jack London Square, Lake Merritt Oakland. @Roland, I think you have some good proposals in there and the routing of the tracks under Mission/Howard is interesting. However, I still feel that given the variance of train arrival times, a 3 track throat is a better solution for approach. Either that, a 2 track throat with a 1 track loop back, so we can have 2 trains arriving and 1 departing. The Second street alignment does not work for the Transbay tunnel and the station throat is not constructible (page 9) even if it did. Did you notice the two crossovers in Recommendation #7 on page 18? 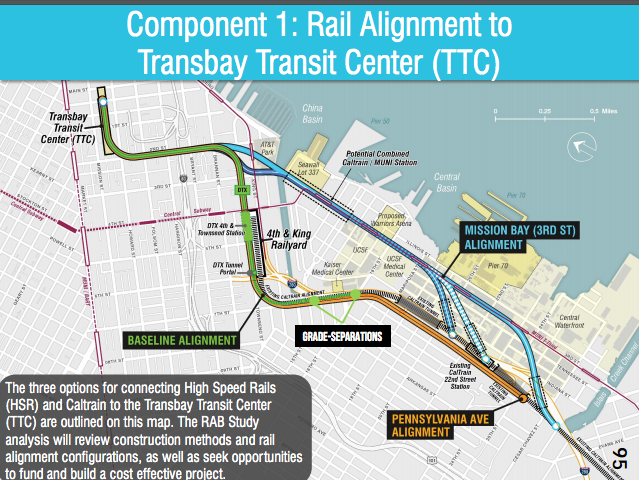 Their purpose is to allow 12 trains/hour/direction between Transbay and Bayshore until the Transbay tunnel is built at which point Transbay will have three northbound and three southbound tracks and will be able to support 30 trains/hour/direction but most of these trains will have to turn around at Bayshore. Last but not least, the second street alignment makes it impossible to have 6 full-length through-tracks because it wastes 1/3rd of the train box just to make the 90 degree turn (see Recommendation #1 on Page 7).